Karen! 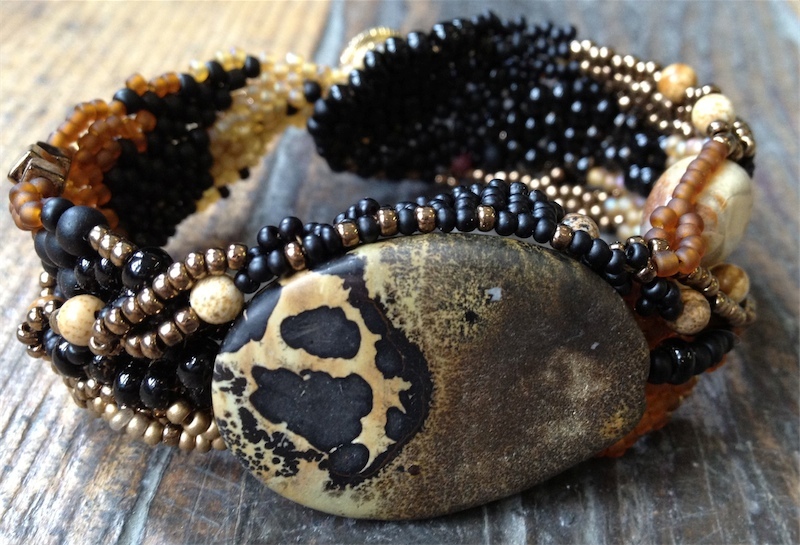 I am so envious of your earthy, rustic, down right beautiful freeform peyote choker!! I love, love, love how the browns create such a wonderful pattern!! I'm envious because over the past month I have tried and tried to create a freeform peyote bracelet (your original bracelet is so stunning, too).. mine have been it's been an epic fail! I'm going to be contacting you for help!!!! Thank you so much for joining in on the challenge/hop!! I can't stop staring at your gorgeous bead work!! Oh, heavens this is gorgeous! Love the jasper, and the change in button is wonderful. Girl, you do such beautiful work!! Very beautiful and original work.I love the free form peyote stitch,because it allows our Beading Fantasy to spread the wings freely.Brown is beautiful and has got thousand'faces'.You have used those shades in the very interesting way.Also all the additions to both pieces are synchronized perfectly. First, let me compliment you on your beadweaving skills. My eyes and hands would never be able to do this technique, nor would I have the patience. Your piece is stunning! It reminds me of a safari, or some remote destination in some exotic far-away place. This is one of the most beautiful designs I've ever seen! It's funny how you compared it to snakeskin, because when I first saw it I thought it resembled a snake that I'd see here in the desert - only much more beautiful!! I'm amazed at your talent and yes, brown is one of those fogotten colors - but it's one that I wouldn't want to live with out! My jaw is still on the floor over this stunning work of art! It DOES have a snakeskin look! I love freeform work and this is exceptional! Wow! That is just a true piece of art. I love the beading and the way you incorporated the stones. I agree that it almost looks like snakeskin. The bracelet is also stunning. I am just in awe. Another jaw dropping piece of jewelry. I love it! I love the snakeskin look and the freeform feel of it. Yes, it is definitely western in feel. First thing I did was run to your shop to see if you had listed it. But, then you said it wasn't quite done. Oh well, I love it. Great job! I love your piece it is beautiful! I am in awe at your talent with free form peyote. I have always wanted to try free form but have been scared to try. My first thought when I saw your choker was a Rattlesnake skin. I love the button you chose and the Jasper focal is gorgeous. My jaw is still hanging open and my eyes are bugging out from the sheer WOW factor of your snakeskin bracelet. Awesome work!!!!! This is creative genius!! Love the progress photos! So very, very beautiful! You really gave brown the attention it deserves! 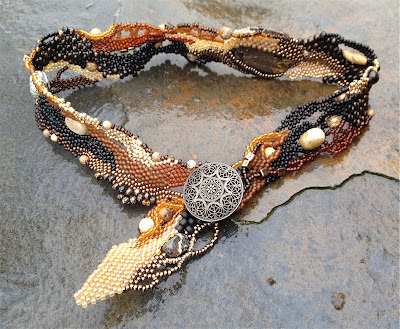 This piece is so pretty and all the browns are just gorgeous together! Wow, gorgeous! 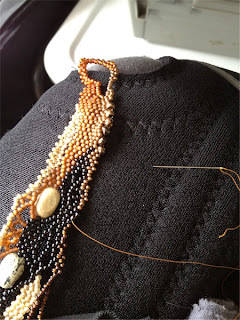 To me, the bead weaving resembles fabric, it's so beautiful! Karen, this is beautiful! 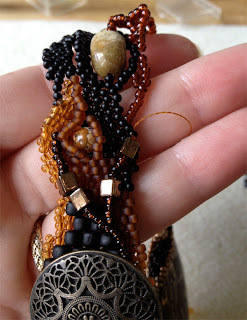 I love the original bracelet, too, and I think your new piece is gorgeous - the rich combination of browns is lovely! Oh, it's Leonard's big sister! And she's beautiful. It looks like one of those beautiful rock formations in the desert, with the striations and variations of colors from each layer of geologic activity...I think she's perfect as is. Great job, as always, my friend! This is absolutely beautiful. I love your button choice and the mixture of browns is awesome. Great job. Love your work. I am in awe of seed bead creations and the use of browns is really beautiful here. Just gorgeous. 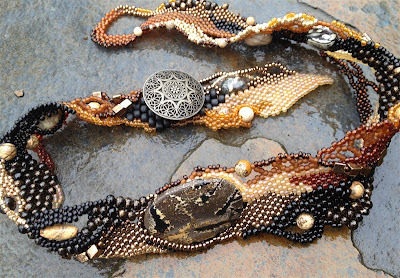 Love the modulation of the color and the freeform use of peyote. Fantastic!! Wow! This is fantastic!!! Am amazed! Wow, this is the second freeform peyote piece I've stumbled across on this blog hop and I love it...the design and your choice of colours are just gorgeous...I can see chocolate, coffee, caramel and liquorice. Yummy! I love this choker! It does look like snakeskin! I love freeform and I'm an admirer of your work. This beautiful and gives new meaning to the color brown! Gorgeous! Oh how I wish I could create something like this! 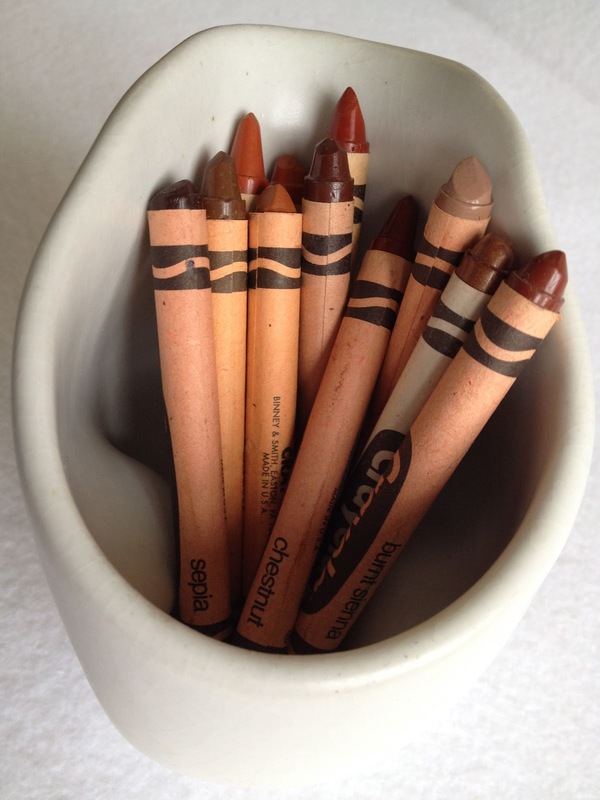 Wow, what a gorgeous study of the color Brown. Love it. I like that it is still evolving. I tend to forget that brown is a color too, but I love what you've done with it here! The beadwork is just perfect for the focal bead. I wish I had known about your book when I first started free form peyote. You do beautiful work! I can relate when you say you wonder if you are done.....I have the same thoughts often. It is hard to know when to stop. I am going to follow your blog now. Wow, brown is not boring at all, gorgeous work!! I love EVERYTHING that is going on here...I love the focal, or when the back is front that it looks like a small scarf. I love the soothing earthy colors. I love the stitches and beads. I LOVE the button choice---best of the 3 for this piece! I LOVE it all and really need to work out of that lovely book of yours I received this winter! I hope the knee brace isn't a result of a trapeze incident. Oh what you've done with brown! This piece is so full of texture I just want to touch it!! Very cool necklace. Free form peyote? I am always amazed and intrigued! Gorgeous variety of browns, lovely work! Wow! I love brown and free form peyote....beautiful.